The title of this post may sound like an oxymoron as the highest point in the Netherlands (at least the European part of the colonial empire), Vaalserberg, is a small rise of 1,059 feet. To put this in perspective, I'd like to inform my readers that there are higher hills in my hometown and we're a 10 minute drive to the beach. 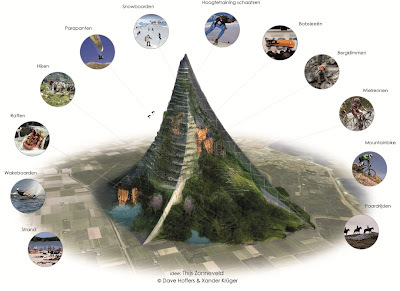 Last month, a Dutch journalist and cyclist, Thijs Zonneveld made the humorous suggestion that the nation build a 1k mountain. He said, tongue-in-cheek, that it would only take €300 billion and maybe 30 years to build. Well, proposals for the hypothetical mountain (dubbed Die Berg Komt Er, or the Mountain Comes) have now been drafted by a tiny architectural firm of Hoffers and Kruger. The idea has also gained backing from the Dutch Cycling Union, the Dutch Climbing and Mountaineering Association, and the Dutch Ski Association. Well, it's certainly an ambitious proposal – building a mountain that might cost half of the country's GDP for a few sporting events. I guess their next big hurdle will be to find a location to put it. How did this come to your attention? The location would be in the North Sea, 10 km of the coast near Amsterdam. Or in Flevoland, a piece of land reclaimed from the Zuiderzee in the 1960s. It would also be great for speed skating, our nr. 1 winter sport, since a high altitude means less air resistance so they can skate faster. Our GDP is 780 billion, so even if the costs are down to 100 billion it's not feasible. Rob, I can't recall how this came across my radar. It was on the Internet and my first assumption was that it was a big joke, but it seems as though the idea was serious enough that some people at least took it a step past the hypothetical stage. No matter how you look at it though, it would be hard to figure out how to recoup expenses on such a build.